The National Examination Board in Occupational Safety and Health (NEBOSH) is an UK based Board found in 1979, provides a numerous education program in which NEBOSH IGC is the most admired and wanted course by a number of people and HSE professionals. NEBOSH IGC (International General Certificate) qualification gives the opportunity to become a safety professional, a valuable employee in any company. The role of safety officer is to ensure safety in workplace i.e. they should follow and monitor all the protocols, policies & other measures. In order to become a safety officer/ Advisor/ Superintendent etc. This NEBOSH IGC gives the best platform. The NEBOSH IGC course syllabus is set out to sustain in all the industrial fields. NEBOSH IGC contains 3 units in which 2 units are of theories which will be conducted by the British Council. The 3rd unit is practical assessment and it should be submitted to the NEBOSH course provider. IGC 1: MANAGEMENT OF INTERNATIONAL HEALTH AND SAFETY. This NEBOSH IGC 1 unit covers the basic foundation of health and safety, the first and foremost thing is to PLAN, how and what should be done, the second thing is to DO, is what should be i implemented according to the plan, the third thing is to CHECK, the plan executed efficiently or not. The final thing is to ACT, whether the previous steps are been followed properly. This paper provides the full awareness about safety, health and management. The passing criteria for this Unit is minimum 45 out of 100 which contains 8 no’s of 10 mark questions, 2 no’s of 20 mark questions. Workplace Hazards and Risk Control. Transport Hazard and Risk Control. Musculoskeletal Hazards and Risk Control. Work Equipment Hazard and Risk Control. Electrical Safety. Ex. Electric shock, fault current, improper grounding may leads to risk and this may be overcome by regular inspection, using insulating materials like gloves, suits may be used. Chemical and Biological Hazards and Risk Control. Ex. Acids used for cleaning and some gases like helium, acetylene when exposed unfortunately may leads to lung damage or allergic conditions. Physical, Physicological Hazards and Risk Control. These 8 elements are covered in GC2 Unit which consists of 8 No. of 10 mark questions, 1 no of 20 mark questions. The passing criteria for this paper is minimum 45 out of 100 alike IGC 1. 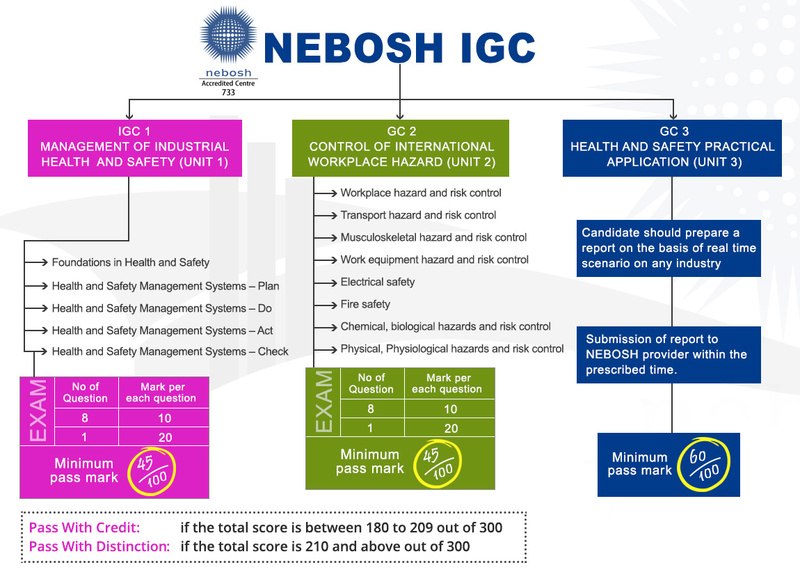 This NEBOSH GC 3 is a practical assessment paper in which the candidate must prepare a report on the basis of real time scenario of any industries like oil and gas, construction company or any kind of industry and analyze on the work done with the knowledge gained in IGC1, GC2 and submit the report to the NEBOSH IGC course provider in which the 60 marks is minimum criteria to get pass. If the Total score (i.e. all total marks of IGC1, GC2 & IGC3) is 180 out of 300, the candidate will be considered as "Passed with credit." If the Total score is 210 and above out of 300, the candidate will be considered as "Passed with distinction."